Following to her first and second piece, “Amorosi” and “Briganti“, Annelies de Ridder comes back with a very cool and modern edition of Big Uamou “Salt ‘n’ Pepper”! 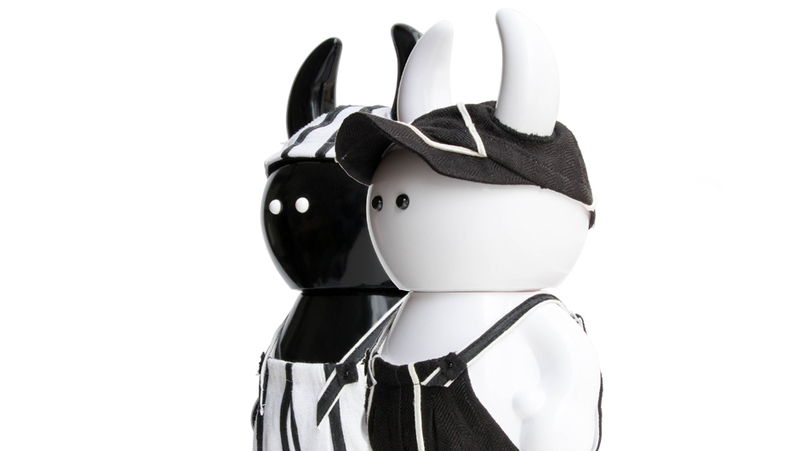 Clothed by the Master herself, both Uamou come in a custom-made costume consisting out of a cap and overall. They look alike as a twin but in fact they have unique clothes each other that illustrate their different personality well. The pair is displayed at our atelier shop from today until next Sunday, February 25th and will be sold to the lottery winner! * How to participate in the lottery? Send an email to info@uamou.com. Please make the subject as “SALT ‘n’ PEPPER entry” and enter your full and real name in the body of a mail! Click here to easy entry. ◆ The payment of the item should be made via bank transfer or PayPal. More details will be mentioned in the winning notification mail. If we couldn’t receive proper payment or reply by the specified due date, winning may be invalidated. ◆ Winners notified by March 5th, 2019. ◆ Dispatch of item will be scheduled in early March 2019. ¥950 yen (for domestic shipment) or ¥1,500 (for overseas shipment) will be charged separately as shipping fee. Since 1985 Annelies de Ridder has been working under the Cavalieri Kostumes Banner and has created thousands of costumes for international stage productions. Always interested in exciting new collaborations, Cavalieri executes each design with attention, focusing on authentic materials, detailing and craft.